These three charming little mice will provide you with the sweet scent of summer all year round. Each one is hand knitted in the finest lambswool or vintage fabrics and filled with lavender. Hand embroidered with a cute pink nose and tiny felt ears. Pop between your clothes drawers, or display on a nursery shelf, they make the perfect gift for young and old alike. 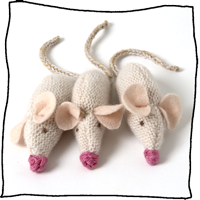 The mice are beautifully presented in a little bag of three fabric or three knitted mice or a combination of both. Dimensions: Each mouse is approx. 6cms long. Select a single quantity for three mice.